Over the years I have had a few people ask me abut whether castles are haunted, and if I’ve ever experienced “anything” when visiting. Its a curious question. All old buildings have an atmosphere to them. Some are pleasant, peaceful, relaxing, and others are less so. I try NOT to research a property too heavily before I visit as I want to see the building with as clear a mind as possible. 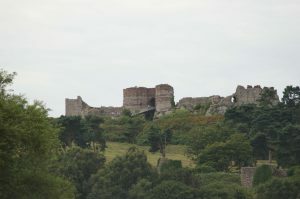 What I can say is that there are some castles which I find oppressive and unpleasant to be in which give no indication of that from their history. And there are some which claim to have a violent and bloody past which I have not found to be so. By and large, those castles which I’ve been told are haunted are among those which I have felt absolutely nothing at whatsoever – to me they feel lifeless. 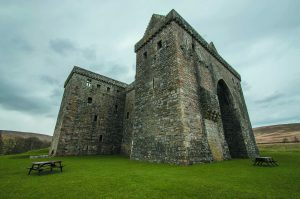 Take Hermitage Castle in the Scottish Borders. It looks mean, moody, and oppressive, and certainly there were some unpleasant things happened there. But to me it was empty. It was nothing more than a ruined shell, quiet apart from the wind whistling about me, and without any discernible atmosphere. However, when I was in Milan, my wife and I went into the crypts of the Duomo – that hoofing great cathedral in the middle of the city. I have never felt so uncomfortable being in a space in my life. It was absolutely horrible. The atmosphere was nothing short of hostile, angry and threatening, and I could not wait to get out again. Yes, there were dead dudes in cases there – all the archbishops of Milan, mummified, and that was pretty grim. Yes, it was unpleasant to be able to see grinning human skulls in purple and gold robes in every direction. But they werent actually frightening. It was the place that gave me the willies. And I’ll tell you something, I’m NEVER going back in one of those places again. So I am sensitive to the atmosphere of a building. And yes, I have had experiences at some sites which cant be explained – voices, movement where there was nobody actually there. I’ve even had conversations out loud and turned around and there’s no-one physically there. That happened to me on the way down from Beeston Castle. But have I ever seen a white lady, a green lady, someone floating down the hallway? No. If there are actual ghosts out there, that’s not how they manifest themselves to me. Its more of a feeling most of the time. 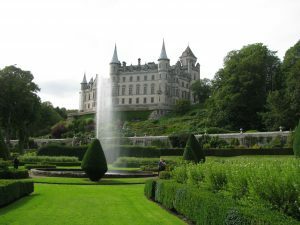 Mostly its innocuous, although I wasnt that keen on the nursery at Dunrobin. Something wrong there. And as long as that feeling isn’t anything like the freaky Duomo crypt, I’m happy. Ghosties dont worry me! I was going to share a picture of the Duomo crypt, but when I saw the image I felt a bit queasy. So here’s Beeston, Dunrobin and Hermitage for you.